Transparency Market Research (TMR) has published a new report titled “Cardiac Biomarker Diagnostic Kits Market - Global Industry Analysis, Size, Share, Growth, Trends, and Forecast, 2018–2026.” According to the report, the global cardiac biomarker diagnostic kits market was valued at US$ 2,100 Bn in 2017. It is projected to expand at a CAGR of 5.3% from 2018 to 2026. Rise in number of patients with cardiovascular diseases globally is a major factor driving the cardiac biomarker diagnostic kits market. Cardiovascular diseases (CVDs) are the leading cause of deaths across the world. According to the World Health Organization (WHO), CVDs accounted for over 17.7 million deaths in 2015, which represents 31% of the total deaths globally. The number of deaths due to cardiovascular disease is expected to be more than 23.6 million by 2030. Rise in the number of deaths associated with cardiovascular disease is likely to add to the cost of management of the disease. The global burden due to cardiovascular disease was US$ 863 Bn in 2010, which is expected to increase to US$ 1,044 Bn by 2030. The report offers detailed segmentation of the global cardiac biomarker diagnostic kits market based on disease indication, product, testing, and end-user. The market has also been segregated based on region (North America, Europe, Asia Pacific, Latin America, and Middle East & Africa). The troponin segment is likely to drive the global market. Key players are tapping opportunities to introduce high sensitive troponin biomarker, which is becoming a preferred choice for the diagnosis of heart attack, thereby driving the cardiac biomarker diagnostic kits market. The global cardiac biomarker diagnostic kits market has been segmented based on test type, disease indication, product, end-user, and region. Based on product, the market is categorized into troponin test kits, bnp test kit, CK-MB test kits, myoglobin test kits, c-reactive protein (hsCRP), and others (galectin-3, H-FABP, myeloperoxidase, ischemia-modified albumin, and homocysteine). 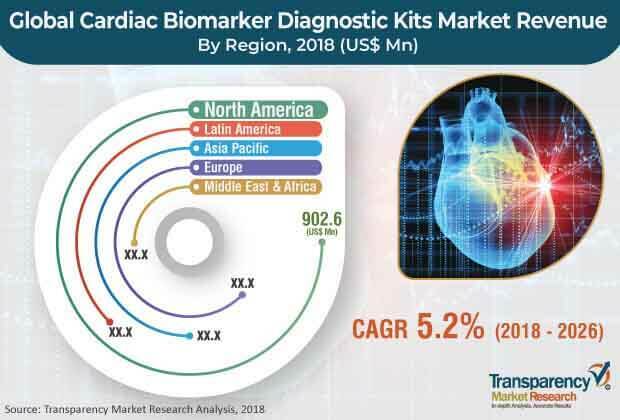 In terms of disease indication, angina pectoris, myocardial infraction, cardiac heart failure, and others are major segments of the global cardiac biomarker diagnostic kits market. Based on product type, the troponin segment accounted for a prominent share of the global cardiac biomarker diagnostic kits market in 2017. This segment is expected to maintain its leading position in the global market during the forecast period. Key factors driving the market include an increase in prevalence of various types of cardiac diseases and rise in incidences of cardiac related diseases to the vital organs. Toponin possess fast processing abilities and provides quality results, as compared to other tests. Consequently, it is being highly preferred by healthcare specialists. Based on disease indication, the angina pectoris segment held a notable share of the global cardiac biomarker diagnostic kits market in 2017. This segment is expected to expand during the forecast period owing to an increase in the prevalence of angina pectoris across globe, rise in instances of cigarette smoking among the global population, and increase in the geriatric population. Moreover, several technological advancements are occurring with regards to decreasing side-effects associated with biomarkers tests and early detection of the illness. These advancements too are driving the demand for cardiac biomarker diagnostic kits globally. In terms of region, the global cardiac biomarker diagnostic kits market has been segmented into Asia Pacific, Europe, Middle East & Africa, Latin America, and North America. North America dominated the global market in 2017, owing to increasing healthcare expenditure leading to a rise in demand for better diagnostic tests and health care services, and widespread technological advancements in the field of cardiac biomarkers occurring in the region. However, the market in Asia Pacific is projected to expand at a significant pace by 2026, due to the availability of a large patient pool and increasing awareness about deadly healthcare concerns. Additionally, high percentage of geriatric population and increasing disposable incomes are also expected to propel the market in the region..
Major players operating in the global cardiac biomarker diagnostic kits market are Abbott Laboratories, Hoffmann-La Roche AG, Bio-Rad Laboratories, Danaher Corporation, Siemens Healthineers, Thermofisher Scientific, bioMérieux, Randox Laboratories Ltd., and Ortho Clinical Diagnostics. They account for a significant share of the global market. The market is characterized by a large number of acquisitions, which has led to market consolidation and increasing dominance of top players. In 2017, Abbott completed its acquisition of Alere, concluding a deal first announced in February 2016. Abbott Laboratories, Hoffmann-La Roche AG, and Siemens Healthineers hold the major share of the global cardiac biomarker diagnostic kits market.